Please note that the import progress bar does not disappear unless the browser is closed. Defining import character encoding in settings (instead of auto-detect) appears to be a solution. Some appetite for Table of Contents feeds? Individual users may subscribe to TOC feeds in a reader client to receive information about recent publications. They can also apply web tools (like xfruits) to aggregate feeds and convert them to another message format. Website owners may use syndication services to dynamically integrate article information into their applications. For an example, check the homepage of the National Library of Health Sciences at the University of Helsinki (FeedNavigator boxes). However, one question remains: What will happen to the ticTOCs service now – after project end? Ed Pentz announced in the CrossRef Quarterly from May 2009 that "CrossRef is now investigating hosting the service on an ongoing basis", see version cached by Google. Currently, the ticTOCs homepage lacks an option to report problems or corrections, so the service manly relies on harvesting publisher websites. Will this be enough to keep the service up-to-date and unambiguous? Most of you have already been introduced to the Citation Linker which is a simple tool to access MPG/SFX services for a known reference by entering information manually. The number of monthly SFX requests per sources prove that the Citation Linker (“CITATION”) is very frequently used and therefore it was not really surprising to receive enhancement requests for this tool. Chapter helps you entering data for items published in a book, see example. Patent allows the location of issued patents and patent applications, see example. Resources referenced under http://vlib.mpg.de are available as feeds in RSS 2.0 format. 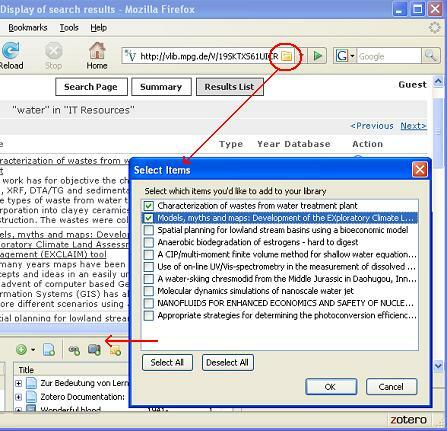 Resource feeds may be created by applying the usual filters to the complete list of resources as they appear in vLib. Feeds are either created on the fly, for example, by requesting all Full Text Databases, or they can be addressed as static feeds which are updated daily, for example resources recently added or complete list of resources (A-Z). Local views exist for every feed. Please see http://vlib.mpg.de/vlib-rss-feed.html for detailed information. Because you instructed it to do so. Just uncheck the Preferences (“Einstellungen”) option “Use Zotero for downloaded RIS/Refer files”. The feature is implemented by an unapi interface on the top of MetaLib X-Server. A new service has been added to the MPG/SFX menu. The citation creator allows you to display the bibliographic information in a selected citation style (APA, BibTex, etc.). More information is available in the vLib project documentation.